Newark had a workhouse from at least 1628 — the Sheffield Corporation's accounts from that year onwards record that they spent around £200 on the erection of a workhouse and that the building's carpenters were sent to inspect an already operating workhouse at Newark. In 1786, the town erected a new workhouse at the east side of Hawton Road (now Albert Street) from the funds of Magnus, Brown, and Phillpot's charities. The small borough gaol adjoined the workhouse. The Poor are maintained partly in a Workhouse and partly at their own homes. The inmates of the Workhouse number 54, of whom 20 are under 15 years of age (including 3 bastards); 10 of the children work at the cotton mill lately erected here; the other paupers are employed in such work as suits them, in different parts of the town. Grown people are allowed 2d. in the shilling from their earnings. Children have no perquisites, but are now and then paid a halfpenny. The whole earnings from the Poor in the house amount to £90 a year. 42 regular pensioners (including 12 bastards) receive £3 2s. a week. Several house rents are likewise paid; and a large sum is expended by the parish every week in discretionary payments, the amount of which would not be ascertained. The badge appointed by the Act of King William is worn by paupers in this parish. It was laid aside a few years ago, but the Poor having increased very much, it was resumed in 1794, and in consequence several persons who had before made regular applications to the parish have now declined asking for relief. The Workhouse here is one of the very best in England. It is sufficiently capacious and well aired. The men are lodged on one side, and the women on the other; 2, 3, 4 or 5 beds (some of chaff but mostly of feathers) are in each room. The house is well supplied with vegetables from a good garden, and in all other respects both within and without, it exhibits a degree of comfort and cleanliness that is seldom met with. A few apartments, rather neater than the rest, are appointed for the reception of such persons as have been reduced in circumstances, and their situation receives every attention that humanity can dictate. Bill of fare in the Workhouse: Breakfast—every day, milk pottage. Dinner—Sunday, bread pudding, beef, bread, broth and roots; Monday, bread and pease pottage; Tuesday, and Thursday, boiled meat, broth, roots and bread. Wednesday, frumenty of wheat and milk; Friday, suet pudding; Saturday, dumplins with sauce composed of vinegar, sugar, and water. Supper—every day, beer and bread with cheese or butter, one pint of beer and 2oz. of cheese or butter to each adult. Children in proportion. At dinner all have as much bread and meat as they can eat, but are not allowed to take any away. Certificates are allowed here without scruple; about 3 are granted in a year. There are nearly the same number of removals; only one has been contested in 7 years. The donations and charities are mostly under the direction of the Corporation. It appears that about £120 a year are distributed among the Poor in money, coals, corn, bread, etc. There are 2 hospitals or alms-houses for 14 decayed tradesmen, and 10 widows. They have coals and clothing, and an allowance of 2s.6d. to 4s.6d. a week each, according to their age, and their time of residence in the house. About £140 were collected in the winter of 1794-5, from voluntary subscriptions for the relief of the Poor. In 1817, under the initiative of poor law reformer Sir Robert Heron, the Claypole (sometimes spelt Claypool) Incorporation was formed under Gilbert's Act of 1782. The Union comprised 20 parishes, 5 in Nottinghamshire and 15 in Lincolnshire, and erected a workhouse at the west of Claypole in Lincolnshire, about three miles from the Nottinghamshire border. Attached to the workhouse were a 60-acre farm and one-acre kitchen garden on which the inmates worked. Fulbeck had a parish workhouse by 1807. The Newark Poor Law Union officially came into existence on 24th March 1836. Its operation was overseen by an elected Board of Guardians, 47 in number, representing its 44 constituent parishes as listed below (figures in brackets indicate numbers of Guardians if more than one). County of Nottingham: Alverton, Balderton, Barnby, Besthorpe, South Clifton, Coddington, North Collingham, South Collingham, Cotham, Farndon, Girton, Hawton, Kilvington, Langford, Newark (4), South Scarle, Spalford, Staunton, Winthorpe. County of Lincoln: East and West Allington, Barkston, Bassingham, Beckingham, Brant Broughton, Carlton-le-Moorland, Caythorpe, Claypole, Dry Doddington, Fenton, Foston, Fulbeck, Hougham, Long Bennington, Marston, Norton Disney, North Scarle, Sedgebrook, Stapleford, Stragglethorpe, Stubton, Swinderby, Syston, Thurlby, Westborough. Later Additions: Bennington Grange (from 1861), Broadholme, North Clifton (from c.1837), Flawford (1866-84), Harby (from c.1837), Meering (from 1861), Thorney (from c.1837), West Newark (from 1894), Wigsley (from c.1837). The population falling within the Union at the 1831 census had been 25,089 — with parishes ranging in size from Kilvington (population 29) to Newark itself (9,557). The average annual poor-rate expenditure for the period 1832-35 had been £8,723 or 6s.11d. per head. The new Newark Union adopted two existing workhouses at Newark and Claypole. 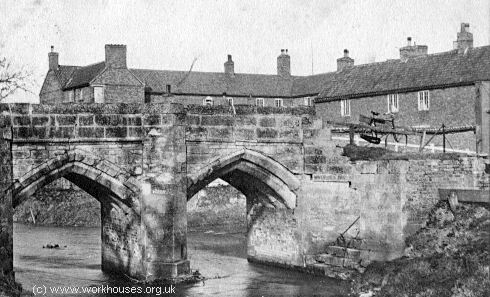 The Claypole workhouse, a three-storey stone building at Claypole Bridge, was used for accommodating able-bodied paupers. Its farm was sold off but the kitchen garden was retained. By 1904, its capacity was 250 inmates. Newark's workhouse at Claypole Bridge. The building was sold off in 1913 and converted into about twenty cottages. It was demolished in 1978. 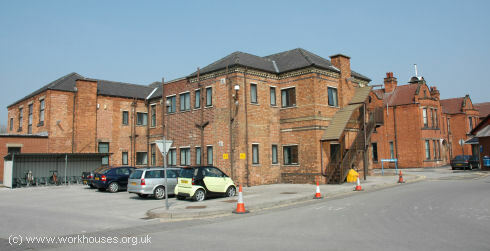 Aged and infirm inmates were housed in the Hawton Road workhouse at Newark. The part of the building containing the town gaol was vacated and a new prison built elsewhere. Part of the building survives at the rear of a former Castle Brewery. In 1878, the Newark Union erected a poor law infirmary and a vagrant ward on Bowbridge Lane in Newark at a cost of £4,000. The building was substantially enlarged in 1908 in a scheme designed by Arthur Marshall of Nottingham. The new buildings adopted the popular pavilion plan layout with a central administrative block flanked by male and female ward pavilions. 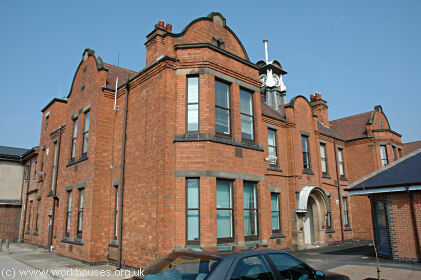 The original 1878 infirmary was integrated into the new buildings, forming the western ward pavilion. The site layout is shown on the 1915 map below. Bowbridge Lane site from the south-west, 2005. Bowbridge Lane adminstrative block from the south-west, 2005. Bowbridge Lane 1878 infirmary block from the south-east, 2005. After 1948, the workhouse joined the National Health Service as Hawtonville Hospital, later renamed Newark General Hospital. The Newark Union established a children's cottage home at Balderton.In 1924, the home could accommodate 20 children, and had Mrs Atkinson as its superintendent. 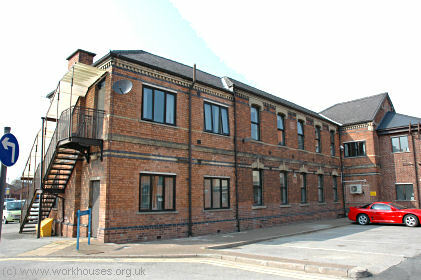 Nottinghamshire Archives and Southwell Diocesan Record Office, County House, Castle Meadow Road, Nottingham NG2 1AG. Relatively few records survive — holdings include Guardians' minute books (1836-1930); Register of non-resident poor (1909-13); Vaccination registers (1881-1932); etc.